I took a photo and I wondered what Georg Sand is trying to say to me. I knew it was in German, but I had no idea what it’s trying to say. Or why it’s there. It’s in a beautiful, tiny green bridge right by the Hua Lamphong Main Train Station in Bangkok. There were a few locks similar to it, but nothing like the hordes that you’ll find in Paris. We crossed a bridge and found ourselves in Chinatown. I let it go then, as Ian and I explored the different sights, sounds, and smells of that side of Bangkok. Yet, I remember that bright pink lock, and that note. I wondered. Who looks for love, does not find it. She surprises us when we least expect it. Much love to our First Anniversary. I wonder who Georg Sand is. What is his life like? How did he meet his love? Did they meet in the train station as they catch a train to Chiang Mai? Did they travel as partners or lovers and explored Bangkok as my partner and I did? So many possible stories, yet I can’t seem to find one and explore. Did they simply get off at Hua Lamphong from the airport and crossed the bridge to go to Chinatown and head to their hostel? But why leave that lock at that bridge? It is engraved, as if they prepared for it. Georg first noticed Maria at the airport. They crawled their way through immigration at the Suvarnabhumi airport, amongst the chaos of tourists and travellers like them. Eventually, they made their way to Basement B, to get on the airport link, on their way to the city. The people didn’t thin, instead, locals and foreigners alike grew thicker, often jostled together, as the train made its was to the city centre. They got out at Phaya Thai station and figured out their way to Siam Station, where all the city lines meet. It was struggle to go from the sky train down to the MRT underground, asking for directions with words they cannot pronounce. Tired and stressed, they caught each other’s eye. And laughed. They were both on their way to Chinatown, where their hostel was located. It was a long train ride, but they eventually found the Hua Lamphong Railway Station. It was a beautiful Art Deco structure first established in 1910, renovated in 1998. They walked past the taxis and tuk-tuks, determined to find their hostel by foot. It is a beginning of an adventure after all. They found a tiny bridge that would take them to Chinatown, about to go their separate ways. Georg asked Maria to lunch, he was hungry. They crossed the bridge together and found a hawker that sells some crab fried rice and lemongrass juice. I’m not a fiction writer, but I imagine two people meeting this way. Their travels creating an encounter, eventually making them take a decision. Do they continue on together, or do they go on their separate ways? George and Maria had lunch, then what? I for one don’t know. 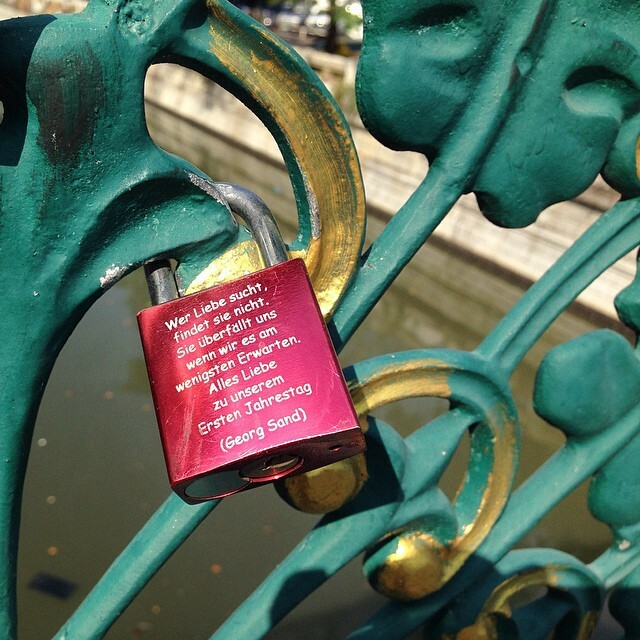 But a year later, there was a pink lock on the green bridge. This exercise is tricky. I’m not sure if this is exactly short. But I remember that lock that I found when the prompt asked me to imagine a letter. And now, here we are. Also, if anyone out there speaks German and English, can you help me out with the translation? I used Google translate and it is inaccurate at best. This entry was posted on April 10, 2015 by Portia Placino in Portia's Narratives, Random Writings, Travel Writing and tagged Bangkok, Fiction, Love Letter, Love Lock, Love Story, Memory, Thailand, Travel, Writing, Writing101.